I had a great response from the post I put up a few weeks ago related to improving split mobility through one variation of the “Hip Performance Complex” I have been playing around with. I think this approach to changing movement and building it into skill performance can be really beneficial. I wanted to offer another one of these complexes for an equally important area of training, which is overhead movements and handstand work. I think this complex is especially good for those athlete’s struggling with the mobility aspect. But it also has some drills I use a lot to help build overhead control, which I feel is even more important. 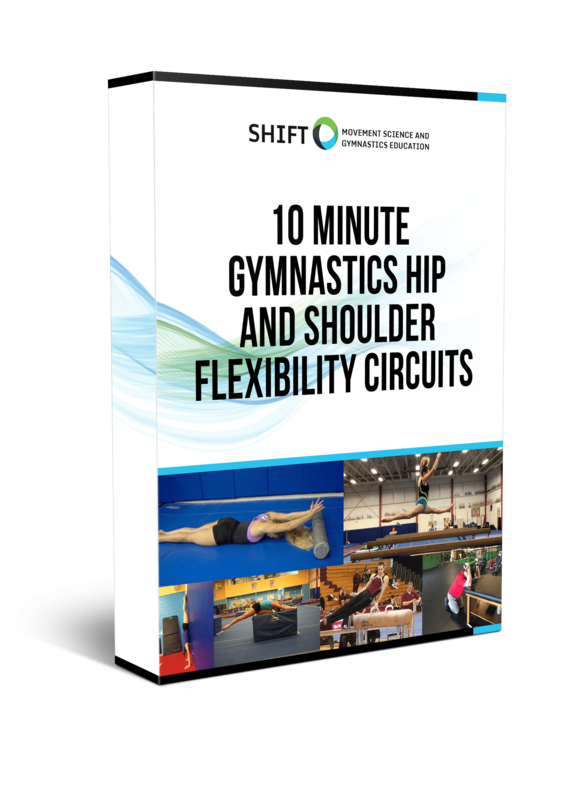 Although the complex is aimed to walk through a progression of movement, I bias it for each gymnast based on if they need more mobility or control. The gymnasts that were naturally mobile spent more time on the control aspect, and the gymnast that were lacking motion spent more time on the mobility aspect. Pay special attention to the first 2 gymnasts in the pre-test line during the video. These are the gymnasts who have been struggling with overhead motion and you can see them make some appreciable changes within just 1 round of the complex. 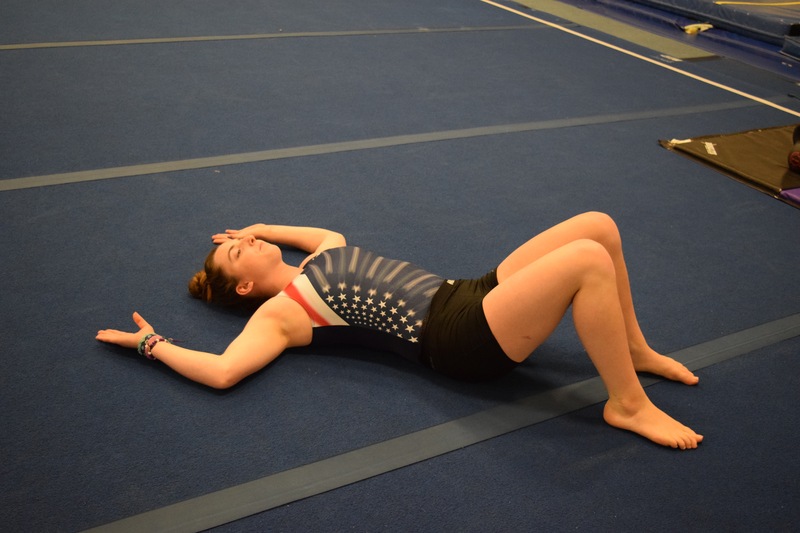 One gymnast (1st in the line) showed a limitation in thoracic motion, and she was given a breathing/thoracic spine mobility drill that helped out. There is much more to overhead motion than just “should flexibility”. If your interested in learning more about that concept, check out an article I wrote last year on it. These are just a few drills in each category, but the list could go on depending on what was limited/which skill you were looking to improve. Say if someone was looking to improve one arm overhead control like in a blind change or pirouette. I may go for lateral core integration, Turkish Get Ups with rotations, and follow it up with single rail drills at a wall after. There are lots of variations I have brainstormed related to other skills or movement profile focuses. Also, I purposefully had the gymnast who had the most limited mobility go the rest of the week without doing anything more outside of regular training to see if there were any long lasting changes. 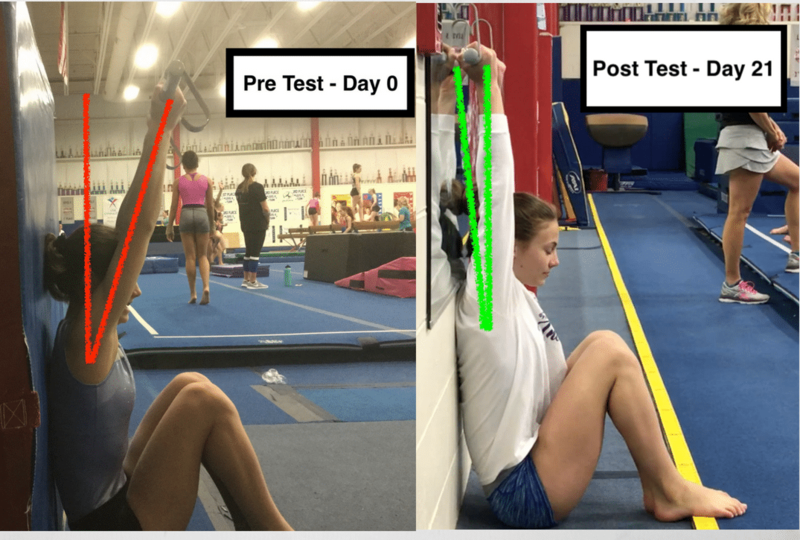 5 days later I had her retest and it seemed like the thoracic mobility stuck really well, and that the overhead mobility retain a decent amount of it, but not all. From now on she’s going to do it every day before practice to keep aiming for improvements. Assuming your daughter is schdeuled to be going five days a week in the summer, that means five 4+ hours of practice per week. As mentioned in the article, that is a lot of hours for an 8-year-old, especially since your daughter is a Level 5.There are, however, no firm guidelines or general agreement among coaches on this topic. The Chinese gymnasts in the national training centers at this age are working twice as many hours, year-round, two sessions per day, six days a week.The problem with doing too many hours of practice at a young age is that gymnasts burn out and don’t stay in the sport. They quit years before they are even old enough for Elite international competitions. Even if the gymnasts themselves are begging to go to the gym more and more, that does not at all mean they are not going to burn out at 13 or 14. Since they want to go and their coaches want them to go to practice more, they rack up too many hours in the gym too soon without anyone noticing. The results of working out too much, too soon is not seen until years later.More hours in the gym does correlate to more possible injuries in the gym. That is only logical, but that is not what would be my concern. 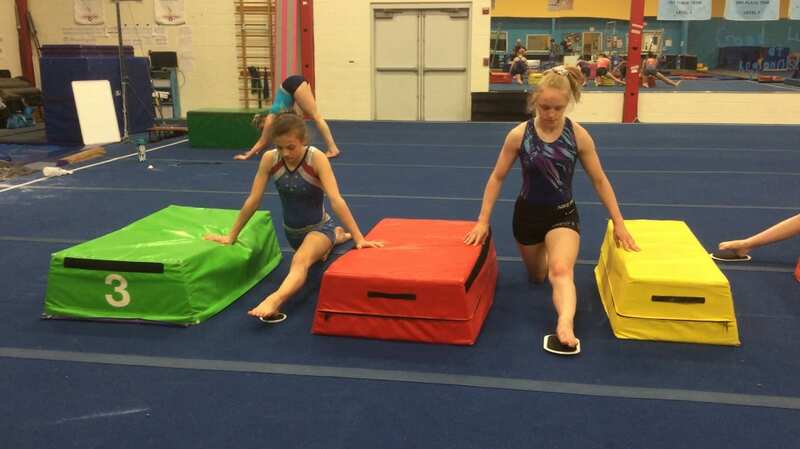 Level 5 gymnasts are at a much lower risk of injury than higher level gymnasts doing way more difficult skills and the extra one hour of practice time is not significantly different than their current risk of injury. While more time in the gym, just like more time on the playground at school, can mean a somewhat higher chance of injury, a healthy 7-year-old Level 5 is not really going to be be at significantly increased danger of injury from one more hour of practice. Burn out in her teen years is the problem to be guarding against and that battle really starts now.While it is true that gyms usually have fewer regular class students in the summer and may welcome any opportunity to make more money to cover summer expenses, it is equally true that gymnasts have a great opportunity to make significant progress over the summer, when they have more free time to practice more and are not tired from going to school all day. Gyms have a right, in that case, to expect to be paid more for more hours of training. That is fairly common in many gyms around the country. I firmly believe parents should support their own gyms financially, especially in the summer, because in the long run, their own gymnasts will benefit.I am a little more concerned with the soreness in her knee. The fact that she is sore in only one knee may be an indication of injury rather than general soreness from exercise. I have a rule of thumb that if a gymnast has an injury interferes with practice for more than three days that having it checked out by a sports doctor is a wise choice. Better to get a diagnosis and start the healing process or for her to to be cleared and to know she can go all out in practice.Overall, this is not necessarily a situation that I would consider changing gyms over. All coaches feel tremendous pressure to get more gym time because there are so many things to work on. Most gyms you would go to will be doing something similar. Summer practices of 3 1/2 hours (17.5 hours per week) for her age would be recommended and one hour more per day (for 20 22 hours per week) should not be a deal breaker.On the other hand, you should feel free to communicate your concerns over the effect of so many hours this summer on long-term burn out and you should monitor your daughter for any signs that she may need a break from time to time. I certainly would not hesitate to let her participate in occasional special summer activities like pool parties, birthday parties, vacations, long weekend family trips, etc.Good luck and if there is anything else we can do for you, please let us know.